Each Christopher is built to order. It is unique to its owner, and the most personal watch we offer. Your Christopher will have a fine Swiss automatic movement, and almost every other part is exclusively, and beautifully, made in England - the dial, hands, strap and 40mm stainless steel case. Look closely at the gilt chapter ring, between the glass and the dial, inscribed with your chosen dedication (see the pictures below). Almost secret, this tiny hand-engraved lettering is a work of art in itself. 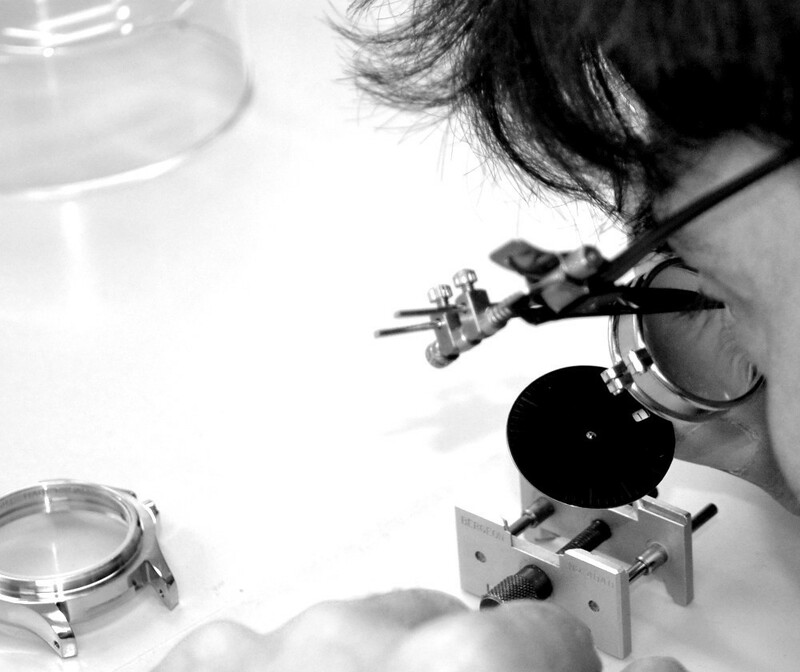 It’s a remarkable detail that (to our knowledge) is available from no other watchmaker, and it makes your watch truly individual. Beneath the parchment (cream) dial is the self-winding movement, a masterpiece of beautiful Swiss engineering. The steel hands are traditionally hand-blued, and the crown is inlaid with a discreet touch of 18 carat gold. Delivery takes about 8 weeks, and the price for this specification is £3,999. Alternatively, the Christopher is available with our ‘infinity’ dial, with Roman numerals, as shown in the gallery at the bottom of this page, at a price of £4,999. Email or call us, without obligation, to discuss your Christopher: alternatively you can order online. Christopher, with engraved chapter ring and optional custom dial with initials. Christopher, showing engraved chapter ring. Christopher, with laser engraved back. When you buy a Harold Pinchbeck Christopher or Special Edition wristwatch, we guarantee the movement's mechanical performance for your lifetime. The only condition to this warranty is that you return the watch to us for a professional service at least every three years.